The lymphatic drainage of the thyroid gland runs in the interlobular connective tissue and then communicates with a network of lymphatic vessels. 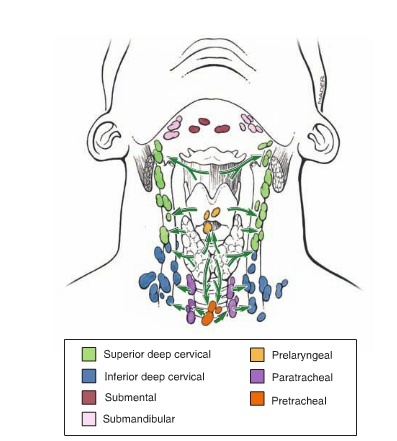 The lymphatic vessels communicate with the tracheal plexus, and pass to prelaryngeal nodes above the thyroid isthmus, and to pretracheal and paratracheal nodes. Some may drain into brachiocephalic nodes. Laterally the gland drains into deep cervical nodes. Some lymph may drain directly, without nodes, to the thoracic duct. Lymphatic drainage of the thyroid gland. The arrows indicate the direction of the lymph. Available: Moore,K.Dally,A.Agur,A. (2010)Clinical oriented anatomy.copyright © Wolters Kluwer/Lippincott Williams & Wilkins.